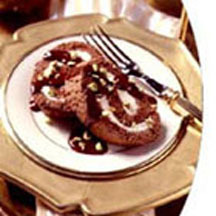 An elegant mascarpone cream-filled chocolate dessert roll served with hot fudge sauce and a garnish of chopped pistachios. For Roulade: Preheat oven to 350°F (175°F). Lightly butter a 15 1/2 x 10 1/2 x 1/2-inch jelly roll pan. Line bottom of pan with parchment paper or foil. Melt chocolate and butter in a medium bowl over a pan of simmering water, stir until smooth. Remove from heat and cool slightly. Meanwhile, place egg yolks in mixer bowl. Beat on medium-high until combined. Gradually add 3 tbsp of sugar and vanilla. Beat 5 min. or until yolks are pale yellow and mixture falls in thick ribbon when beater is lifted. Stir egg yolks then flour into mixture. Wash bowl and beaters. Beat whites and cream of tartar until foamy. When soft peaks start forming, slowly add remaining sugar. Beat on high until whites almost hold stiff peaks. Stir about 1/4 of the whites into mixture, fold in remaining whites. Pour batter into pan and spread evenly. Bake until cake springs back when lightly touched 10 to 12 minutes. Remove cake from oven and cool 5 minutes. Prepare Mascarpone Filling. Gently unroll cake and spread with filling. Re-roll cake gently around filling. Trim off end. (Sometimes the cake roll will develop cracks.) Cover and refrigerate at least one hour. To serve, cut into thin slices and drizzle each serving with some of the warmed ice cream topping. Sprinkle with chopped pistachios.